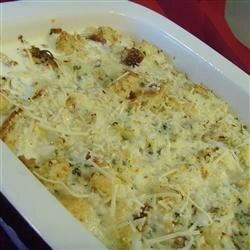 "A delicious casserole - elegant enough for a Sunday brunch!" Preheat oven to 325 degrees F (165 degrees C). Lightly grease a medium baking dish. Bake 1 hour in the preheated oven, or until a knife inserted into center of the casserole comes out clean. Serve immediately.